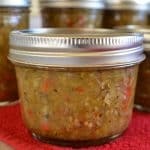 Homemade pickle relish wasn't super high on my food preservation list, but I'm glad I decided to make some since the homemade version tastes awesome! 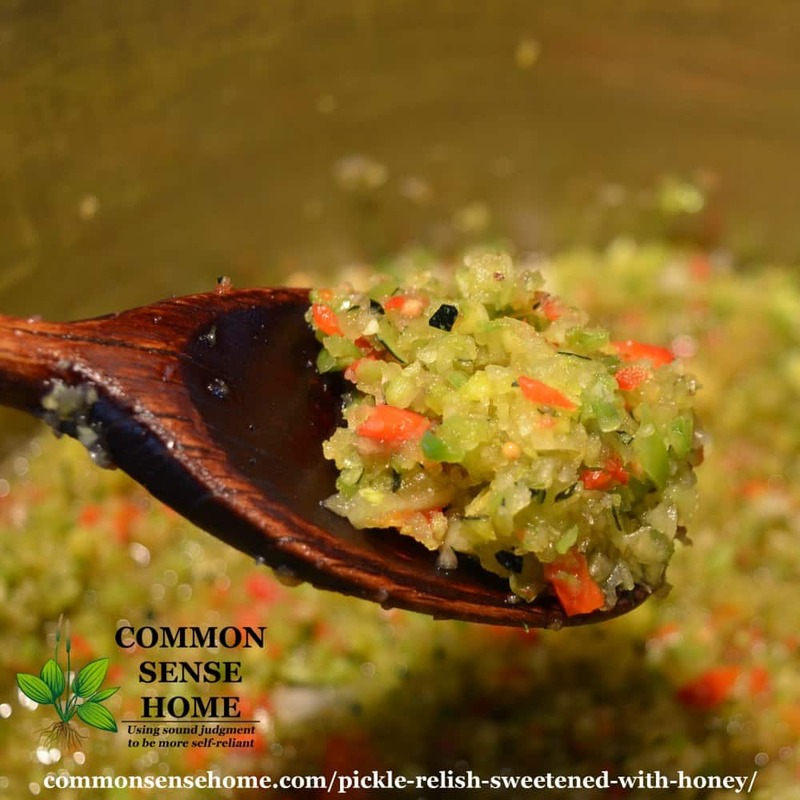 Even my husband, who is not a relish guy, likes this pickle relish recipe. You team up high quality spices, vinegar and honey with your fresh garden cucumbers or zucchini to make something delicious. It's easy, too – just chop, mix, soak, strain and water bath can. Note: This recipe does need to soak for 5 hours (or overnight) to draw the liquid out of the veggies, so start early in the day so you have enough time to finish or later in the day so you let it sit overnight and finish the next morning. Sheesh! HFCS and corn syrup? Two kinds of artificial color? Aluminum? It sounds more like a lab experiment than food. Which would you choose? 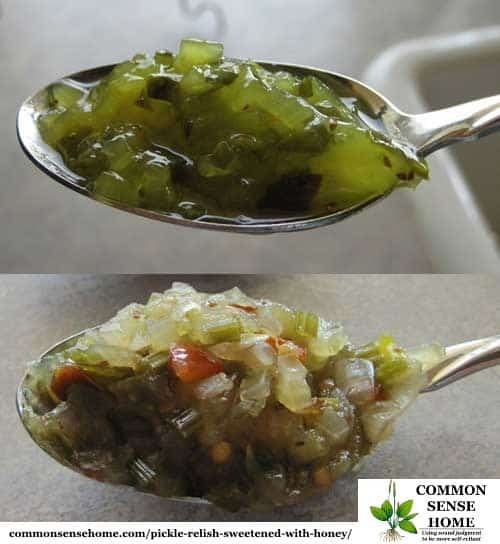 Technicolor store pickle relish (top) or homemade pickle relish (bottom)? Finely chop all the vegetables and combine in a large bowl. Sprinkle with salt, cover with cold water, and let stand five hours. Drain thoroughly in a colander, pressing out excess liquid. In a medium stockpot, mix honey, vinegar, and spices. Bring to a boil. Stir in drained vegetables and simmer for 10 minutes. Pack into hot sterilized jars to within 1/2 inch from the top. Complete seals and process for 10 minutes in a boiling water bath. Yields 9-12 cups, depending on moisture levels of produce. I think mama would be proud, and I know my family will be eating just a little less chemical laden food in the coming year. 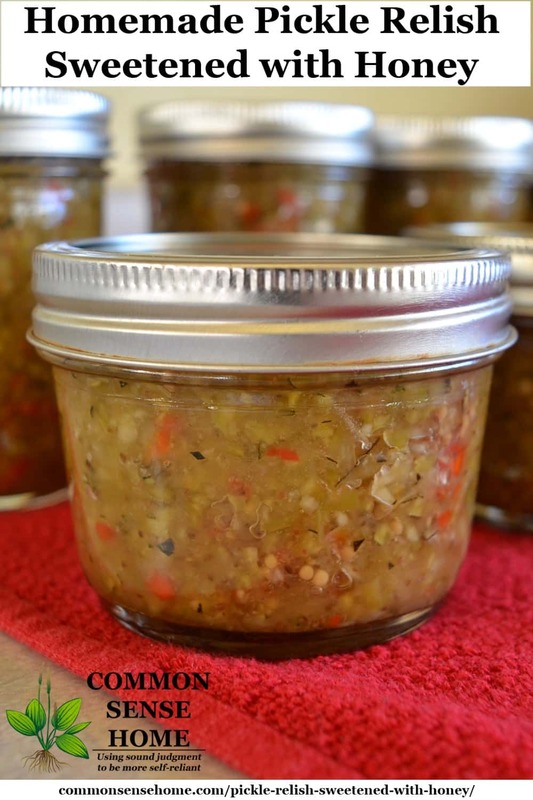 Easy homemade pickle relish made with “just the good stuff”. Gather ingredients. Finely chop all the vegetables. Combine in a large bowl. Sprinkle with salt, cover with cold water, and let stand five hours. Combine honey, vinegar, and spices. Bring to a boil. Stir in drained vegetables and simmer for 10 minutes. Complete Seals. Process for 10 minutes in a boiling water bath. 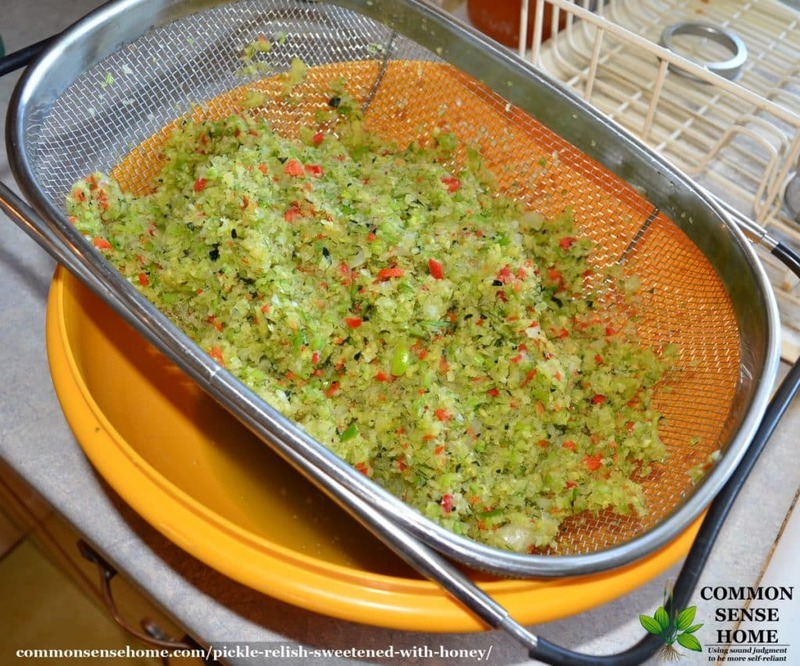 Remove from canner to a kitchen towel placed on the countertop. Allow to cool completely. Remove rings, label and store in a cool, dry dark location. 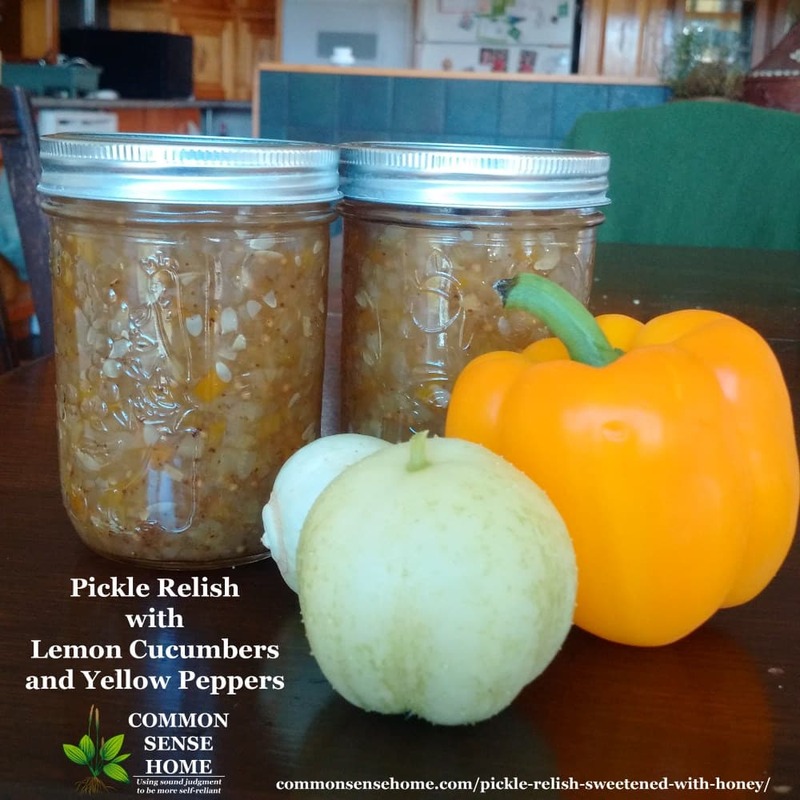 You can pair this relish up with homemade buns and picnic friendly foods such as hot dogs and brats from a trusted local meat store (read the labels – look for ingredients you recognize as food). If you can't find what you need locally, you can buy safer meat products in bulk from online merchants such as Tropical Traditions, where they stock items such as buffalo hot dogs. Originally published in 2010, updated in 2016. That looks delish! I wanted to can this year but have gotten wrapped up in…EVERYTHING else. (sigh) On the list for next year. I'm storing this recipe. Thanks. Wow – that was a quick comment! It took me two weeks to finally get to making this. The summer has flown by this year. That relish looks really good! Remind me to give you a jar next time I see you, Miss MJ. I made up a double batch this year so we have a huge stash. 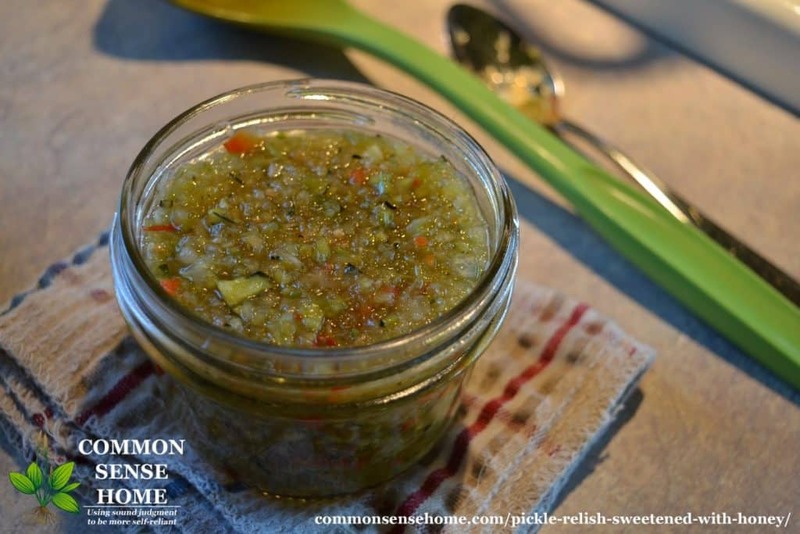 There is nothing like homemade sweet relish! People always think my deviled eggs are the best ever….besides the fresh eggs, it's the homemade relish! Beautiful job Laurie! Laurie, that's incredible and mama would be proud. I wish I could stay with you for a month and soak up all your homesteading knowledge. It's look delish. Great recipe Laurie………it's amazing at the ingredients that put in to so much isn't. There's hardly an item I buy anymore in the store. Laurie………..it may not be a jam, jellie, etc… but THANK YOU for sharing it on the "Nourishing Jams, Jellies…….Blog Hop". We expected there would be a big turn on it…so far it's mediocre, 3 days left. Pamela – in the past I always used more standard recipes with white sugar, so I couldn't link to old posts. Hopefully I'll get a chance to make the plum and cardamom jam before the end of the week. I figured some sort of "preserve" was better than none. Thank you so much for posting this! We usually make relish from a recipe in the Ball Blue Book, which calls for sugar – not as bad as HFCS, surely, but when you're starting with homegrown cucumbers…! Oh, and I love your colander! Heather – I know what you mean about the sugar. This is my first year experimenting with alternate sweeteners/less sugar. I'm sure home processed is still better even with the sugar, but we are trying to cut back. The colander was a gift from a friend and I love it! It is so handy for so many things. Use whatever peppers you like, just make sure not to add more (volume-wise) low acid items so you don't throw off the pH. Thank you for your honey sweetened relish! I’m always trying to get away from refined white sugar! I hope to try this soon. You’re welcome! Thanks for stopping by and taking time to leave a comment. Every time I have canned relish or pickles the pickles are to soft and the relish is like mush. Any ideas on what I am doing wrong? I am using the Blue Book recipe. You are probably not doing anything wrong. I just looked over the Ball Blue Cucumber relish recipe, and there seems to be an awful lot of soaking in liquid and not a lot of draining off liquid. I don’t see how it could be anything but soft with that much moisture. A salt water brine will draw out moisture from the veggies, leaving them crisper. The Blue Book recipe starts with salt water, then uses water, then uses a sugar/spice water mix and doesn’t drain it – too much water! I have found that some of their recipes are safe for canning, but not so tasty. Their pickle recipes are another example of this. Lots of cooking of pickles during processing and canning. Donna at Cultured Food Life suggests using leaves that are high in tannin in a recipe to add crunch, but she cultures her food (no heat processing). She suggests Grape,oak, raspberry, blackberry or cherry leaves. You can read the relevant post at “Need Crunchy Pickles?” I have not tried this with canned pickles. I either make Betty’s Dill pickles, which are kept in the fridge, or my grandmother’s recipe, which I have not published on the website because it doesn’t meet current FDA canning guidelines. I noticed you equated Alum to Aluminum. While it is true that alum is used in pickles I hope you are aware that it is also in Baking Powder. Do you make your own baking powder? Both the alum typically found in pickles (Potassium alum) and the type found in baking powder (Potassium alum or Soda alum) contain aluminum. See What is Alum? for more information. No, I don’t make my own baking powder, but I do buy baking powder specifically labeled “aluminum free”. Frankly, the GMO corn syrup and artificial colors are a greater concern. Yes I did look up alum and that is why my question regarding baking powder. I have never seen any labelled aluminum free in Canada. I do make my own now though as I find it much more cost effective in that I don’t use much and it’s usually outdated before I finish even the smallest container. I agree that homemade is always a good way to be sure the ingredients are up to the standards you need. That’s interesting. Here in the U.S. both Rumford and Bob’s Red Mill are labeled aluminum free, and can be found online or in most natural food stores/sections. I replaced baking powder with a mix of cream of tartar, arrowroot, and baking soda. Baking powder has cornstarch = corn is a relative of sugar. glad to see a good recipe for relish. I lost my husband to kidney cancer last year, but during that time we have been doing a LOT of changes in diet such as no chemicals, colors, etc. Guess what yellow 5 leads to – kidney cancer. your recipe is really good! So sorry for the loss of your husband. All the garbage that’s passed off as food is so frustrating. Hi Laurie….Stumbled across your web-site through Herb&Health….sure am lucky I snooped! Anyway….I do NOT need to waste ink on the ingredient list of commercial products and was thinking you could “click something” to make it right? 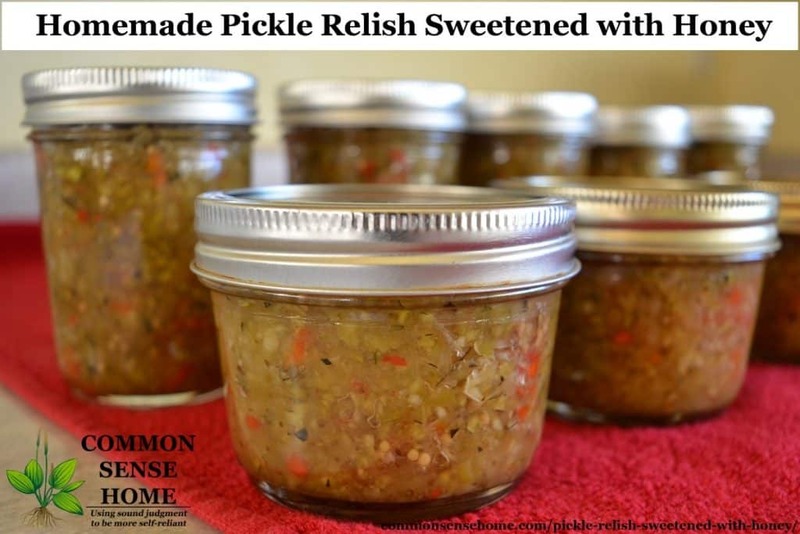 I am trying to print this relish recipe and when I click to delete the ingreds listed for the store bought manufactured reslish….it will not succumb to my demand! Wondering IF there maybe needs to be an adjustment made? Hi Carol. Sorry about the difficulty in printing. I’m still in the process of updating old posts (especially recipes) to make them easier to print. I’ve put the info into the recipe card plugin now, so that should work better for you. Thank you for the healthy recipe. Can you taste the honey at all? How long does it last in the refridgerator once opened? You can taste a slight difference in using honey versus sugar, but the vinegar and spices dominate the flavors, while the sweetness provides a nice accent. I’ve kept it in the fridge for roughly a month once opened. I just made this yesterday, and it turned out wonderfully. I am looking forward to tasting it once it has had time to sit for a month or so. I used lemon cucumbers (small round white skinned cucumbers with a slight lemony taste) and yellow bell peppers instead of green and red. It looks beautiful. I thought of this after I made the batch. Do you think I could substitute part of the apple cider vinegar for lemon juice, to enhance the lemon cucumber taste? I may try this next year, but wanted to check with you if you think this would change the PH or make the recipe unworkable in some way. Bottled lemon for vinegar should work just fine, provided you like the flavor profile. Any chance you’d like to snap a photo and share it? That sounds like a nice mix. I’ve grown lemon cukes, but usually not enough to have extra for relish. 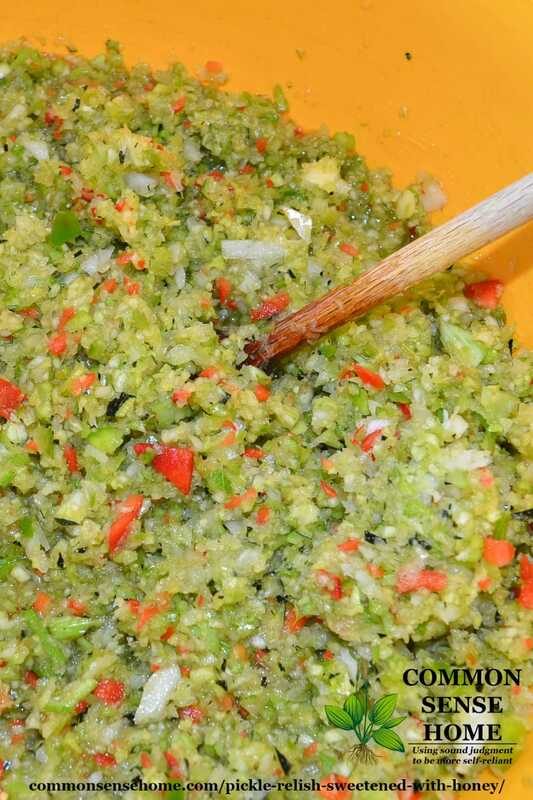 “The acid ingredients used in salsa help preserve it. You must add acid to canned salsas because the natural acidity may not be high enough. Commonly used acids in home canning are vinegar and lemon juice. Lemon juice is more acidic than vinegar, but has less effect on flavor. Use only vinegar that is at least 5% acid and use only commercially bottled lemon juice. I have a picture to post, but I can’t figure out how to upload it. How about you just email it to me at laurie at commonsensehome dot com? With your permission, I’ll add it to the post with credit to you. Delicious recipe! Thank you for the sugar substitution as we have moved from sugar to honey in all of our recipes. We really like this! Glad it worked well for you, too. Don’t skip the salt, sugar and vinegar, but you could skip the herbs if needed. You’ll just have a very bland relish.